FISH CURRY and Rice is the catchy title of the latest in the genre of citizens' reports on the state of the environment, but it tells you little about what the book contains. 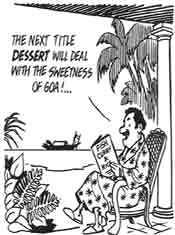 It "does attempt to tell of the Goan recipe for life. And why we should join and support all efforts to conserve it." Published by Ecoforum, a network of Goan environment groups, it concerns itself with the state of Goa, its people and their relationship with the environment. From Ecoforum's point of view, the rallying point for this report has been the depredations by various quarters on the state's natural resources, in 'the guise of developing' the state. And, this assault has stemmed from a preoccupation with industrialisation, initiated during Portuguese rule and fuelled further after they left. Fish Curry and Rice covers such subjects as geographical and topographical features, biodiversity, water and mineral resources and agriculture in the region. 'Burdensome' topics such as tourism, the Konkan railway project, the free port, the presence of large companies and the nuclear set-up at Kaiga are also dealt with. There is useful information provided on the various environmental groups active in Goa. A curious yet interesting inclusion in the book is a tale -- The Man Who Planted Trees -- which appears in instalments at the end of each chapter. The story makes good bedtime reading for small children and, like most bedtime stories, this one, too, comes with a moral: that environmentalism in its truest sense is akin to a form of religion, quite personal and best when pursued in solitude. All said and done, Fish Curry and Rice, "designed as a comprehensive source book of information on the Goan environment and to double up as an environmentalist's manual and handbook", certainly serves the former objective quite handsomely.